After HMAS Australia had been part of the Naval operation at Dakar, West Africa in September of 1940, we returned to the United Kingdom via Gibraltar, and a short stint with Force H there. At Dakar we had collected two shells fired by French Cruisers in that port, although we did not suffer any casualties to our personnel, we needed to enter dry dock for repairs. This old dock built in 1904 is 88 feet long and 36 feet deep. However, there are no cranes available at the docksides, so, on entering dock, all the shores that need placing both sides, (from the dock sides to the ship's sides, to ensure the ship is held both tightly and upright on the dock base block) must be placed by hand, an arduous and time consuming task. We entered this dry dock on Friday the 22nd of November 1940, for a range of repairs and maintenance jobs to be undertaken. William Joyce, was an Englishman who had forsaken his country, and defected to Germany to become a radio propagandist for the Nazi cause, the British people had christened him Lord Haw Haw! Dominating the Liverpool docks is a large, well known, Insurance Company building, called the Liver Building. Conspicious on its towers, one each side, are two quite large stone statues of Liver Birds, a mythical bird that did not fly. "We know HMAS Australia is docked in Liverpool, tonight our bomber raids and our bombs will really make those Liver Birds fly." On the 26th of November, Liverpool was struck by a very heavy air raid, about 1900 (7 PM) off went the Air Raid Warning Sirens, and the All Clear did not sound until 0430 (4.30 AM) the next morning. Private property took a pounding, but this time the docks remained unscathed. 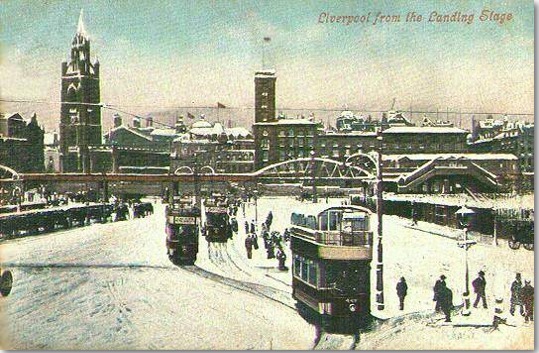 This old photo dates back to 1903, in the background can be seen: The Liverpool Overhead Railway, built in 1893, the first elevated railway to be built and run in Europe. Post war the railway was demolished, and many people would have said why? Prior to this blitz on Liverpool, we took the precaution to partially flood up the dock, thus, when incindiary bombs fell upon our upper deck, personnel especially detailed for the task, would rush up, and quickly dispose of the burning incindiary, with a swift kick over the side into the water in the dock. I had spent some time on this duty during earlier raids. Now, over three successive nights the 20th, 21st, and 22nd. of December, Liverpool took a pasting, thousands of small incendiary bombs were dropped by the first wave of German attacking aircraft, they were designed to set up fires to then guide the follow up bombers loaded with High Explosive bombs. A great deal of damage was sustained, the famous St Georges Hall gutted by fire, and many city landmarks destroyed. Along the miles of docks, an overhead or elevated railway operated, in a number of places, this line was put out of action by bombs destroying sections of this rail line. During the air raid on the following night, Australia continued to be LUCKY. A 500 pound bomb exploded on the port side of our dock putting the dock gates out of action, splinters did some damage on board, but we did not have any casualities. On the 20th of December air raid, a very heavy bomb fell between the starboard side of the ship, and the dockside, it partially exploded, with no apparent damage to us. Action was immediate, quickly flood up the dock, open the dock gates, call up the tugs, and get that ship out of danger as soon as possible. The dock gates quickly shut, the dock pumped dry once more, now members of the Bomb Disposal Squad were called to undertake the unenviable task of rendering our monster safe. These Bomb Disposal Personnel performed magnificent feats in the course of their duties. I had seen in Liverpool, a land mine, which, when descending on its parachute, had its lines caught up on a huge gasometer. There it was, trapped, but swinging in the breeze between two gasometers, just waiting for that extra swing to take into a holder filled with explosive gas, and blow up with a mighty roar and devastation to the local scene. A Bomb Disposal expert was calmly perched in the bucket of a mobile crane, going about his business of delousing this land mine. I hurried away, thankful I did not have that task to perform. A number of Australian Reserve Naval Officers were in the forefront of the bomb and mine disposal business in England, and subsequently became very decorated for the work they carried out. Once again my ship had proved to be charmed, when ashore throughout these devastating air raids, all our personnel managed to make it safely back to the ship. To quote from Gill's Volume 1. History of the Royal Australian Navy 1939- 1942. "Morale was high, especially when encounters with the enemy were frequent." Post war, William Joyce, aka Lord Haw Haw, was tried for treason, and then hanged. Liverpool overhead Railway I acquired it in Liverpool when I went back in 1993, for the 50th. Anniversary of the Winning of the Battle of the Atlantic.